Keep yourself fit – in and around Kochel am See! Inthe summer bike through the countryside with our hotelowned mountainbikes or beat some golfballs on one of the various and luxury Golfcourts nearby.For a total refreshment, we suggest the “Trimini” poolarea located directly next to our Hotel. 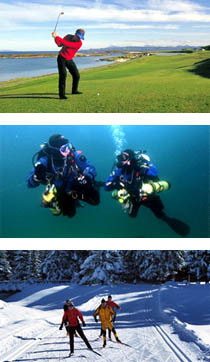 At the lake Kochelsee and the lake Walchensee you can also go fishing, diving, rowing, swimming, surfing and sailing! In the winter pull a nice wooden sled through the mountains and go downhill or use one of the various slopes around Kochel am See, Garmisch and Mittenwald.If you prefer Cross-Countra-Skiing, that is the right place to be. The course starts directly from the parcing area behind our Hotel! More information at the Reception or at the tourist information Kochel.